March Madness hits this week, but don’t forget about college football as we roll out the second installment of our weekly roundtables. This morning, we are back as TSS Associate Editors Bart Doan and Terry Johnson join Kevin Causey and a rotating special guest in our weekly roundtables discussing all things college football. Last week we discussed which quarterbacks you would pick to lead your team as we gave our choices from the P5 and non-P5 schools. This week we continue to analyze the quarterback position as we are joined by Dale Newton of The Duck Stops Here. Question: Which first year starter at QB is poised to have a breakout season and/or will have the biggest impact on his team this season? If this were a prop bet in Vegas or there was a fantasy league for first year starting quarterbacks in college football, you’d put your money on new starters with talent and leadership in a great situation–good coaching, a top program with talent around them and a great chance to win. Rarely does a new quarterback break out of the huddle in September with performances that wow the whole country like Johnny Manziel as a freshman at Texas A&M or Jameis Winston in 2013. Their ability, brash confidence and great supporting casts made them Heisman winners, and in both cases it was evident to everyone by week three that the Aggies and Seminoles had found an exceptional, special talent. It doesn’t take a football Nostradamus or even Kirk Herbstreit to predict that the new starters at Alabama, Florida State and UCLA are stepping into great situations with teams that will be among the frontrunners in their divisions with plenty of beef of front and playmakers to share the load, plus athletic and physical defenses to erase the occasional mistake. Out West, the new starter for the Bruins, be it son-of-a-coach Jerry Neuheisel or 5-star freshman Josh Rosen, has 1575-yard rusher Paul Perkins to carry the ball and Miles Jack to spearhead the defense. With a great recruiting class and plenty of athletic ability up and down the roster, the Bruins are certain to be a factor in the PAC-12 South. Jim Mora is 9-5, 10-3 and 10-3 in three seasons, and this could be the year he takes his team to the Rose Bowl or beyond–but they’ll have to contend with a very strong USC team to win the conference. Meanwhile Oregon fans are excited about their likely new starter, 5th-year graduate transfer Vernon Adams from FCS power Eastern Washington, who was twice runner up for the Harlon Hill Trophy after throwing for over 10,463 yards and 110 touchdowns in his three seasons as a starter. What excites them most is that in two games against PAC-12 opponents, Adams led his outmanned squad to a 49-46 win over Oregon State in 2013 and a 59-52 loss to Washington in Seattle last fall. In the game against the Huskies his team had an onside kick at the end to tie, and in the two outings Adams was 54-76 for 886 yards with 11 touchdowns and no interceptions. Against the Beavers he added 16 carries for 107 yards and two more TDs. Those are better-than-Mariota numbers against two North Division rivals, and while no one expects the 5-11, 190-pound quarterback to perform that well week in and week out, it’s clear he has experience and a playmaking flair that set him apart among likely new starters. At Oregon he’ll benefit from a loaded supporting cast that features a pair of fast, powerful running backs in Thomas Tyner and Royce Freeman, a veteran group of receivers, and seven offensive linemen who have started games. While EWU’s spread attack is different than Oregon’s, particularly in the Ducks use of the Zone-Read, Adams moxie and ability to create should make him an instant hit in the Quack Attack, where his principal job will be to distribute the ball to a bevy of playmakers like Byron Marshall, Bralon Addison and Dwayne Stanford, plus dazzling newcomers Kirk Merritt, Malik Lovette, and Alex Ofodile and redshirt freshman Tony James and Jalen Brown. Adams shows great touch on the fade and the teardrop pass, and he’s got a loaded roster of players who can go up and get the ball for him. The Ducks should be a Top Ten contender in 2015 with seven seniors returning in the defensive front seven. Of course, they’ll have to finish better than they did against a tremendous Ohio State team in last year’s National Championship. This is sort of going all “what kind of beer do you want, I have Bud Light, Coors Light, Miller High Life, and Sierra Nevada” and scoffing at why anyone would choose the first three, but I’m taking the easy man’s way out and going Vernon Adams of Oregon. Adams, a transfer from Eastern Washington, inherits a ready-made offense awash with skill players and winning pedigree that took it all the way to the College Football Playoff final. Since the FCS All-American is a graduate student, he’s eligible to play right away. 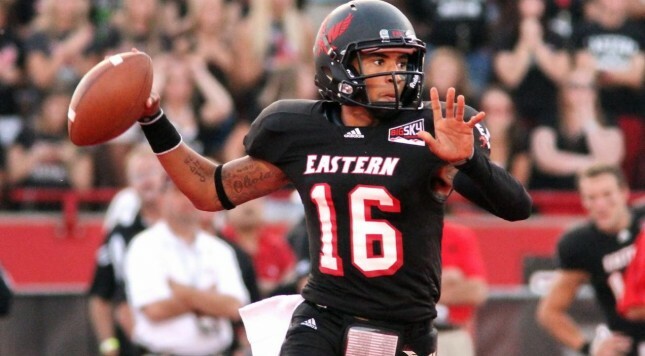 He’s twice been the Big Sky offensive player of the year and threw a stupid 110 touchdowns in three years at EWU. I suppose Jeff Lockie could thwart everyone’s best laid predictions for him, but a dude of that ilk isn’t going to transfer to just any school … he’s going to pick on where he knows he’s going to start. Oregon probably said he’s got a decent shot so long as he shows up and does work. UCLA and Texas were after him, so that should probably give you an idea of how sought after he was. EWU had some sour grapes and some “intent of the rule” stuff when he decided to go, but the reality is that when you can make the most of yourself, you take it on the arches and go do it. There’s more about Adams that works for Oregon. He does okay against the Pac 12. He lit up Washington in 2014 with 475 yards and SEVEN … yes … SEVEN touchdowns in a loss and put up over 500 yards of total offense in a win against Oregon State. Ah yes, beating Oregon State. That specialized skill set on the resume couldn’t have played poorly in Eugene. Either way, this is a massive coup for Oregon, who will look to get off the grid of being the “best program that hasn’t won a college football championship” next year. Again. That depends, does someone who started at another school count as a first-year starter? Assuming the answer to that question is “yes”, then the easy answer is Eastern Washington transfer Vernon Adams of Oregon. In three seasons as the Eagles’ triggerman, Adams threw for 10,438 yards with 110 Tds and only 31 INTs. More importantly, he excelled against Pac-12 defenses, torching Oregon State for 411 yards passing in 2013, while terrorizing Washington to the tune of 475 yards last season. Adams is also a very effective runner, running for a respectable 4.2 yards per carry at EWU, including 107 yards against Oregon State in 2013. Given this extensive experience, it’s a safe bet that most people wouldn’t consider Adams as a first-year starter. After all, he’s already has two Pac-12 games under his belt, posting a 1-1 mark against the conference the last two seasons. If I couldn’t select Adams, I’d pick Thomas Sirk of Duke. Better known as the guy who threw the game-winning touchdown against Virginia with a jump pass last year, Sirk was used mostly as a runner, gaining 238 yards on 48 carries in spot duty behind Anthony Boone. However, he also did a solid job throwing the ball last year, connecting on 10-of-14 passes for 67 yards and a very respectable 3/0 TD-to-INT ratio. With three seasons of experience under his belt (including a redshirt during the 2013 campaign), Sirk should be able to run the entire Blue Devils offense, providing him with a leg up on other first-year starters who might not have learned the intricacies of their attacks just yet. Expect to see big things from him this fall. When I woke up this morning, it appears that I landed smack dab in the middle of the Vernon Adams fanclub. Adams could very well be the breakout player of college football next year but he’s also following in the footsteps of someone who won the Heisman Trophy last season. No matter what he does, he won’t be able to shake the comparisons to Marcus Mariota and it will be interesting to see how that affects him on and off the field. With my three associates all picking Vernon Adams, I’m going to stay in my neck of the woods…the Southeastern Conference. The SEC had a down year for quarterbacks last season and looks headed for another one this year but there are a couple of guys who fit the bill for this question and one player in particular that I’m extremely interested in seeing play extended minutes is Jeremy Johnson of Auburn. Nick Marshall gave Auburn a wicked dual threat at QB over the last two years but as a quarterback he left something to be desired in his accuracy and touch. Johnson will give Malzahn a quarterback that is more accurate and with his big gun, he will open up the field for the Tigers. With Marshall, teams had a fear of the run that opened up some passing lanes but with Johnson teams will fear the pass which will open up the run. Johnson has familiarity with the offense and has already shown that he’s capable of success completing over 70% of his passes during the last two years and boasting a TD:INT ratio of 9:2. The combination of Johnson and wide receiver D’haquille Williams will put up some big numbers at Auburn this year and combined with Will Muschamp’s defense will have the Tigers once again in the hunt for the SEC Championship.